The fickle nature of weather patterns is ultimately responsible for the where and when of tropical rainfall extremes which wreak damage on agriculture, infrastructure and people. Tropical cyclones, such as Enawo which battered Madagascar in March, can severely impact low-lying, highly populated regions through intense rainfall combined with strong winds and storm surges. Explosive thunderstorms operating at smaller spatial scales can generate flash flooding and may lead to devastating landslides in mountainous terrain. A sustained dearth of rainfall or multiple failed seasonal rains, as implicated in drought currently impacting Somalia, Kenya and Ethiopia, are also inextricably linked with evolving weather patterns, often driven by the slower heart-beat of the oceans as they pace out the internal rhythm of El Niño Southern Oscillation and its decadal counterparts. Despite the dominant role of chaotic atmospheric and oceanic fluctuations in meting out extremes of weather, there are several controlling factors at the largest terrestrial scales. Barely perceptibly, they nudge the distribution of extremes away from present day patterns through global climatic changes caused by the influence of human activities on the planet’s energy budget. Rising concentrations of greenhouse gases in the atmosphere are slowly but inexorably perturbing the climate system, modifying the ultimate fuel for rainfall extremes: water and energy. While detailed computer simulations capture the fluid, thermodynamic essence of the atmosphere, the processes building up to rainfall extremes, the fine-scale detail of convective storms, must be approximated using a simplified approach but very much rooted in physics. The reliability of future projections out across progressively more distant decades relies on fundamental linkages between the skill in depicting essential physics at the tens to hundreds of kilometre scales and the unrepresented detail which determines impacts. Nevertheless, there is a physical basis for anticipating substantial yet contrasting changes across wet and dry meteorological regimes as the climate warms. 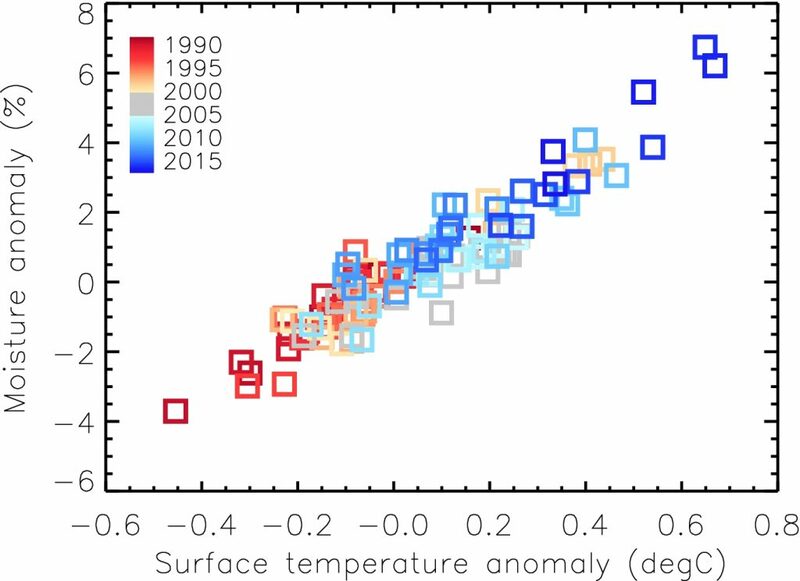 Figure 1: Monthly anomalies in observed tropical total column integrated moisture and surface temperature. Using updated data from Allan et al. (2014) Surv. Geophys. As global temperatures increase, the invisible, gaseous water vapour in the air becomes more abundant, to the tune of 7% for each degree Celsius of tropical warming. This is incontrovertible, observable (see Figure 1) and has huge implications for climate. Water vapour amplifies climate change through the most well-known vicious cycle (warming leads to more atmospheric moisture and a more potent greenhouse effect which feeds back on the warming, amplifying the magnitude of the climate’s response to rising greenhouse gases). This increase in moisture crucially also fuels a greater intensity of rainfall. When considering the vast areas experiencing the seasonal progression of the tropical rainy belt, the simplest result of a warming planet is the intensification of the wet seasons. The chaotic nature of weather patterns dictates that seasonal rains may fail one year while be supercharged in another, depending on the precise position and mood of this rainy belt as it straddles the hemispheres. Yet when conditions are right for a seasonal deluge, it will be more intense in a warmer world due to the more copious quantities of available moisture blown in by the winds. Things get more complicated when considering the dry zones and dry seasons. Averaged over many years, more atmospheric moisture arrives from over the ocean than is exported from land. If this wasn’t the case, then rivers would have to run in reverse! But for the dry season, a warmer, thirstier atmosphere can more effectively sap the ground of its moisture and temporarily export moisture out of the region. 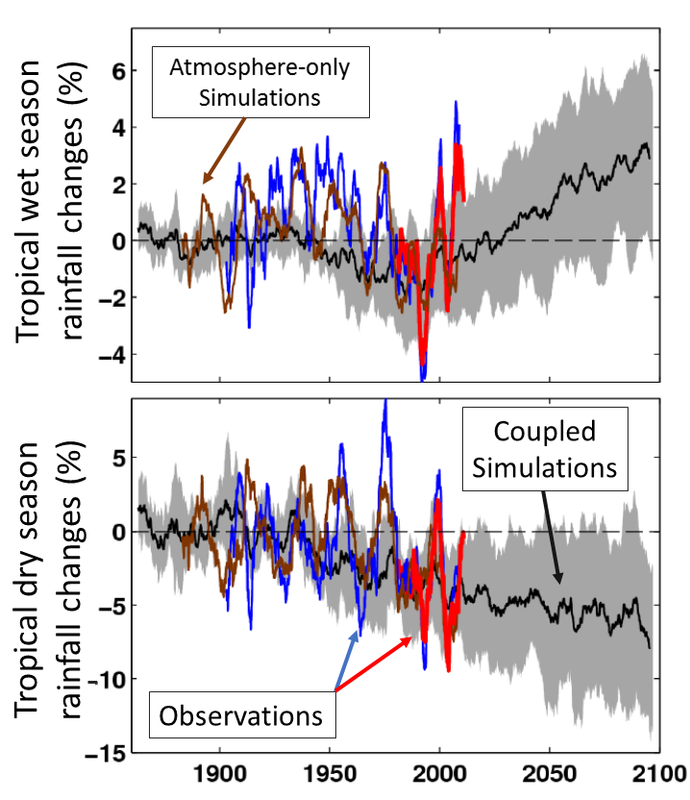 While “dry-gets-drier” does not apply in a simplistic way over land, intriguing signals of amplification in the seasonality of rainfall are apparent over tropical land with chaotic fluctuations superimposed upon longer-term trends (Figure 2). More intense dry seasons have potentially serious consequences for ecosystem productivity. Yet these signals are confounded by dominating variations in weather patterns and by movement in the climatological locations of wet and dry regimes over time. Better defining of the wet seasons is an important step in detecting and monitoring changes important for impacts on societies. The intensification of wet and dry seasons appears a likely but not guaranteed response in a warming climate yet substantial changes in rainfall, increases or decreases, are projected for considerable proportions of tropical land over the 21st century. This post originally appeared on the Weather & Climate blog.